Microsoft Fix Now – one our client’s website doubles its organic traffic (website visits and engagements achieved through search engines) by our effective on page and off page optimization. It was our best SEO project which competes with websites like Microsoft. The Microsoft Fix Now website’s seo started when they called our customer care executive and asked for our SEO package prices. As it was a beginning website, there were zero authority values available in the website. So there were lot of works to conduct with the project. Our team conduct an effective website analysis, keyword research & conduct a detailed competitor analysis. There were lot of issues with the website of Microsoft Fix Now. The website was developed with wordpress. The theme and design used in the beginning was not user friendly and mobile friendly. Our seo analyst suggest for new wordpress theme which is responsive mobile friendly. The design options suggested were suitable and relevant for the project. So by the guidelines of our SEO team, the website solved main issues identified. Our main attempt was to make the Microsoft Fix Now website more mobile friendly as well as user friendly. Our analysis activities identified main issues connected with the website. Loading time problems, total search engine visibility, page authority & domain authority available. Popularity, social media signals, content quality, relevancy etc. At initial stage the website was having very low traffic ranking. Since the website was a new one, the number of visits and interactions achieved were very low. After few weeks the website started to achieve traffic ranking. Search Analytics Report downloaded from Google Search Console for Microsoft Fix Now. The website started getting organic traffic (natural visits achieved from search engines) from its main targeted counties. Microsoft Fix Now Website is currently getting thousands of organic visits, lakhs of impressions, responses & interactions from Google and other search engines. The website is visible in Google for thousands of keywords relevant to the category topic. 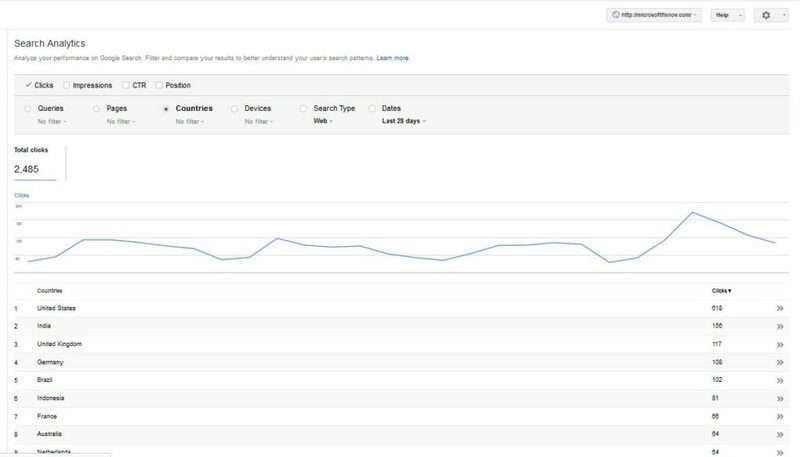 This is search analytics report downloaded from Google search console. 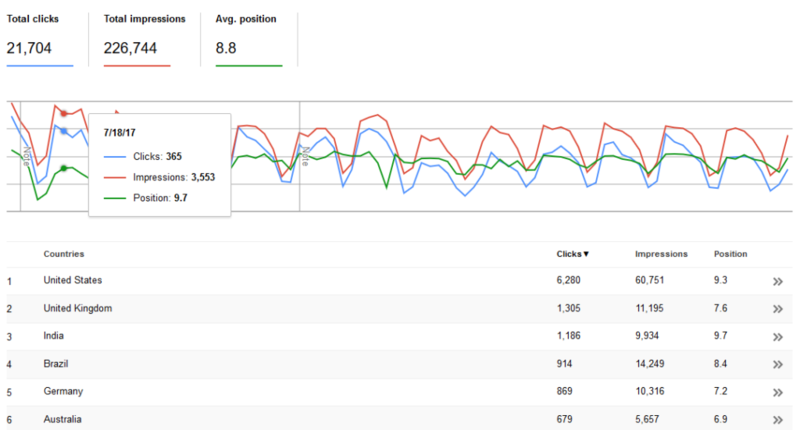 The screen shot shows the number of clicks achieved, impressions achieved and average ranking position. Check out Country wise organic traffic achieved from Google alone. This SEO Case Study is published to business owners who wish to check out our SEO success stories. This starter case study is also useful for seo professional who can implement best strategies in their projects.